Our 2 oz Custom Imprinted Shot Glasses offer and fun and unique new way to do shots at your bar or venue. Custom Print on these Novelty Shots with any logo or message you choose. 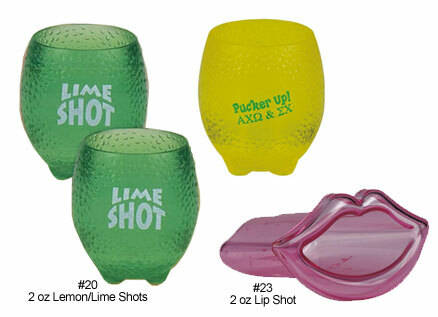 Choose from many Novelty Shots including our 2 oz Lip Shot and our 2 oz Lemon/Lime Shaped Novelty Shots. To order these Acrylic Shot Glasses, just call 1-800-233-0828. 20 2 oz Lime Shot Glasses 1.25 1.16 1.08 1.06 1" 1"
20 2 oz Lemon Shot Glasses 1.25 1.16 1.08 1.06 1" 1"
23 Lip Shot Glasses .98 .94 .89 .85 1¼" 1¼"
For additional information on our Custom Imprinted Novelty Shots or our other Bar, Restaurant, Night Club, and Catering Supplies, please contact us at 1-800-233-0828.